Greetings from your Advocate Team! We are an enthusiastic team of educators, pastors, writers and APCE members from around the US (plus one member abroad!) whose volunteer ministry is to gather and share innovative ideas in educational ministry with members of APCE and the wider church. 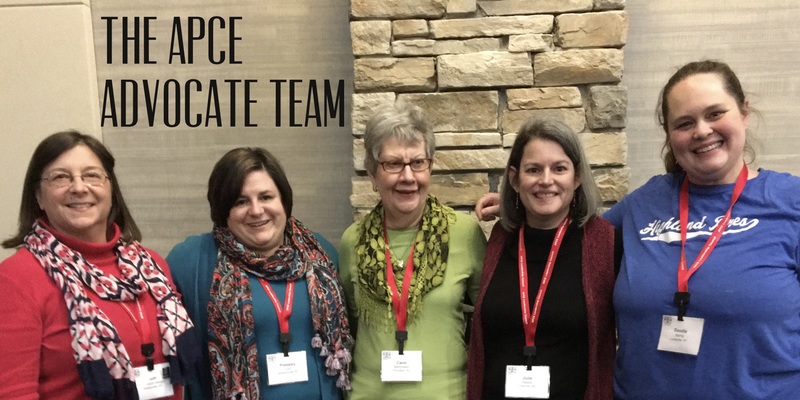 This past week the team hung out at the APCE Annual Event in Denver. We had an amazing time learning together, laughing together, and sharing joys and concerns of educational ministry together. We look forward to sharing with you links of interest, keynotes, and other interesting ideas Annual Event attendees heard and experienced, as they become available. APCE members: continue to check your Monday emails from the Advocate to engage with these resources. We are enthusiastic and energized for another year of articles and discoveries together. Now that we have heard from one another, we want to hear from you! What articles would you like to see? What interests in educational ministry do you have? What questions and thoughts do you have about ministry happening around our denominations? What would be most helpful to you? We welcome ideas for writers and topics. Email us at the link below. Thanks for journeying with us through this first year of blogging. We look forward to many more!